Artsy, Rough Or Soft: What Does Your Accent Say About You? STEREOTYPES abound in Mancunians’ perceptions of each other’s accents, according to a new dialect map by Manchester Metropolitan University (shown below). Sociolinguists Dr Erin Carrie and Dr Rob Drummond noted a lack of research on Manchester dialects, and so tasked final year students with a 'perceptual dialectology' investigation- a study in which non-experts identify accents and dialects and then give their opinions. Members of the public were asked to draw borders on a map of Manchester, highlighting where they thought accents changed, before adding adjectives describing the dialect of each location. Each participant was also encouraged to provide select personal details. The resulting composite map appears to reflect social stereotypes with several words identifying character traits rather than accents. 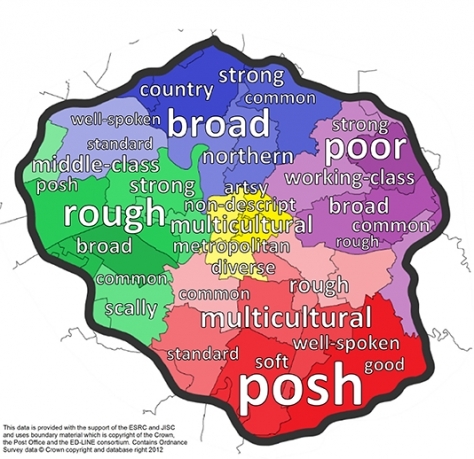 For example, an accent itself cannot be ‘poor’ but that is the label most strongly associated with areas of Eastern Manchester. In contrast, Stockport and surrounding areas of Southern Manchester have been described as ‘posh’ and ‘good’. Research and consolidation will continue into the 2015-2016 academic year.